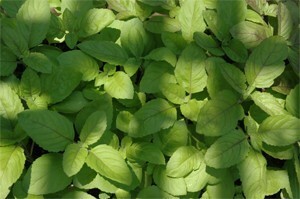 Holy basil has both medicinal and spiritual importance in India. It is sacred to Lord Vishnu, the Hindu god of preservation and is considered purifying to mind, body, and spirit. A living Tulsi plant is kept in many Indian courtyards where it is believed to provide divine protection. Medicinally it's been used in the treatment of colds and flus, to cleanse the respiratory tract of toxins, and in the relief of gas and bloating. The oil is an antioxidant and is used for pain and arthritis. Recent scientific reports have confirmed the healing potential in medical conditions ranging from diabetes to cancer. Furthermore, Tulsi may even possess useful antibiotic activity, have a blood pressure lowering effect and be effective as a birth control agent.